This is delicious on its own or as a tattie accompaniment. 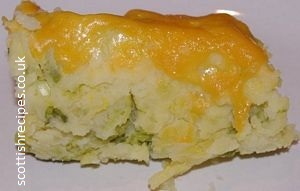 It is nicknamed the Scots version of bubble and squeak. Traditional Scottish Rumbledethumps can be eaten on its own or with a meat dish. The name comes from the noise made in the kitchen as the tatties and cabbage are rumbled and thumped in the preparation. Sue Lawrence in her book Scots Cooking: The Best Traditional and Contemporary Scottish Recipes says that it is a Borders dish. Her Rumbledethumps recipe differs slightly from the one below in that she also uses turnip and chopped chives and prefers to use Savoy cabbage. 1. Take equal measurements of boiled tatties and cabbage and mash/mince and mix together adding finely chopped up spring onions and a wee bit of butter. Add salt and pepper. Modern Rumbledethumps recipes from Scotland see the addition of 2 tablespoons of cream to give a much creamier mashed potato mix. 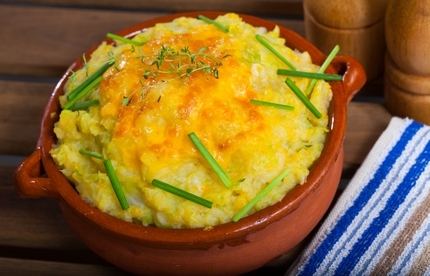 Others suggest placing the potato, cabbage and spring onion mixture into an ovenproof dish after being boiled and mashed together. This dish is then topped with grated mature Scottish cheddar cheese and placed in a pre heated oven at 190C for 25 minutes. Maw Broon's Cookbook has rumbledethumps recipes which includes the use of additional vegetable ingredients such as chives and a small onion in addition to the spring onions. Maw also adds several tablespoons of single cream. In 2009 Prime Minister Gordon Brown contributed Rumbledethumps as his favourite Scottish recipe for a cook book for the Edinburgh school Donaldson's School for the Deaf.